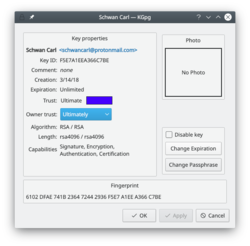 GnuPG encrypts and decrypts your mail and selected files. There are many command-line options to achieve this. With KGpg the anxiety is removed - you don't have to remember any commands. KGpg can help you set up and manage your keys, import and export keys, view key signatures, trust status and expiry dates. In fact just about everything you need to do is covered by KGpg. A wizard is provided to help you set up your keys. 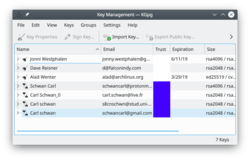 KGpg is integrated into Konqueror and Dolphin, where a context menu allows you to choose to encrypt a file, with or without signing. As you can see in the image above, you can extend the life of your keys using the Change Expiration button. Simply choose the new date from the popup calendar. To do this, however, you must have access to the private key and its pass-phrase. Without them you can do nothing. Should you suspect your passphrase is compromised, you can change this also from the Key Properties dialogue. The Change Passphrase button is below Change Expiration. If you lose your private key or think it has been compromised in some way you need to revoke it. To reliably render a key unusable you need to revoke it. Revoking is done by adding a special revocation signature to the key. The revocation signature can be created together with the key. In this case it is stored in a separate file. This file can later be imported into the keyring and is then attached to the key rendering it unusable. Please note that to import this signature to the key no password is required. Therefore you should store this revokation signature in a safe place, usually one that is different from you key pair. It is a good advise to use a place that is detached from your computer, either copy it to an external storage device like an USB stick or print it out. If you have not created such a detached revocation on key creation you can create such a revocation signature at any time choosing Your Key -> Revoke key, optionally importing it to your keyring immediately. 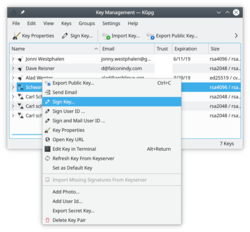 The option to revoke a key has only been available in the context menu until KDE SC 4.7.1. Since then it has been moved to the key menu. When you start KGpg with default settings it will hide in the system tray. If you started KGpg and do not see it anywhere you can probably reach it when you expand the Plasma system tray widget. If a contact has more than one key - perhaps some old keys in addition to the current one - and the wrong key is being used for encryption, find the old keys and reduced their Trust status to Not Trusted. They will remain available for decrypting old messages, but not used for new ones. A full illustrated manual helps you through some details. If you are not in a position to physically verify the identity of your contacts you should especially read the key-signing section which explains the benefits of local-signing. This page was last modified on 28 February 2019, at 23:13. Content is available under Creative Commons License SA 4.0 unless otherwise noted.